The Dallas Independent School District opened three more single-gender schools this year, bringing the district's total to five. The Irma Lerma Rangel Young Women's Leadership School opened in 2004 and has earned national recognition. Its success led the way for the Barack Obama Male Leadership Academy to open in 2011. And now in 2016, the district opens Young Women's STEAM Academy at Balch Springs Middle School, Young Men's Leadership Academy at Fred T. Florence Middle School and Solar Prepartory School for Girls at James B. Bonham Elementary School. "The minute I saw these girl's faces, it was pure joy," said Principal Nancy Bernardino. "This is the moment we've been waiting for for a year and a half." Solar Prep is the dream of a principal determined to give girls a solid foundation in math, science and leadership. Bernardino proudly welcomed the first 198 kindergarteners, first and second-graders to the school on Monday. The school will add a grade level every year and eventually educate 750 to 1,000. It is open to all girls who live within the Dallas ISD boundaries. The district, through funding from a bond program, will expand the old James B. Bonham School where Solar Prep is housed to accomodate for the expected growth. A news release from the district said, "the building itself, constructed in 1924 as James B. Bonham Elementary School, stopped being a school after the 2011-2012 school year. A dwindling student population meant the school wasn’t financially feasible to keep open as a comprehensive school. The district occupied Bonham by using it as office space until the Solar Prep concept was approved. Work began in earnest the past few months to convert the facility back to a school, not only returning it to its normal function but modifying the spaces for a more modern style of teaching." "I have four boys," said Bernardino. "My boys are 9, 10, 11 and 14, and I get the question, 'Mom, why did you open an all-girls' school?' I had to explain to my boys, this is a need." The need, said Mike Koprowski, the district's chief of transformation and innovation, is rooted in several reasons. "The fact that it's single gender. It's STEAM, but also a diverse enrollment. It's the first time in the district we've run an income-based admission lottery," said Koprowski. STEAM stands for science, technology, engineering, arts and math. The challenging curriculum, a socio-economic diversity model and social emotional learning are Solar Prep's three priorities. Bernardino and a team of three other veteran educators wrote the proposal for Solar Prep as part of the Public School Choice Initiative in Dallas ISD. The district approved the plan and tapped Bernardino as the first principal. As for the income-based admission lottery, half the girls who attend are eligible for reduced or free lunch; the other half is not. "Right now, we have girls from Seagoville to Addison and everything in between," said Bernardino. "We want to extend so girls are truly representative of the whole district." "If we're surrounded by people like us, it's harder to develop empathy, hard to understand different perspectives," said Koprowski. 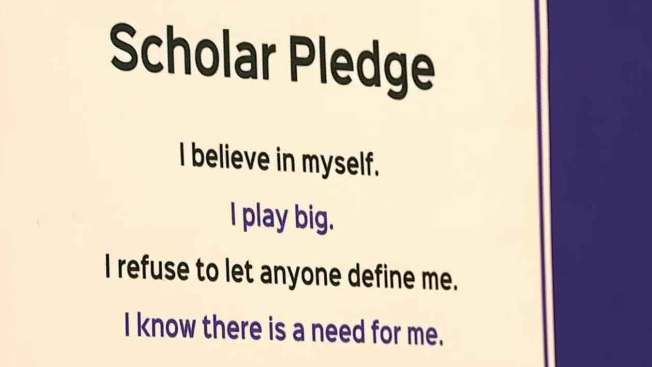 Empathy, curiousity, self-awareness, humility, leadership and grit are the Solar Six, qualities Solar Prep hopes to instill in its scholars as they are taught and shown how to lead with confidence and purpose. "Humility and grit," said parent Amelia Giddens. "They want girls to be humble but they want them to take charge, to be fierce. So, when I heard about it, I jumped on it." Giddens has a first-grader and a kindergartener now attending Solar Prep. She is excited about the possibilites for her daughters. "I love the dual language program," said Giddens. "Kylie, my kindergartener, got chosen for it and they said by fifth grade she'll be fluently speaking Spanish." Solar Prep also hopes to get girls fluent in the languages of science, technology, engineering, art and math. Through hands-on learning, the girls, or future trailblazers as Bernardino said, will be exposed to possible careers in fields where women are traditionally underrepresented. "Every day they will go to the maker space, a space where they can use their creativity to make whatever they like," said Bernardino. "Computer design, coding, robotics, draw, paint. We want to provide an enviroment where these girls can be themselves and the sky's the limit."